If you’re a small business who is looking to gain a dominant online presence in your local market – you’ve come to the right place. Our company prides itself both in its free information on this site – as well as the services we perform for clients – to help you be at the top of the search engines for the terms your customers are searching for. 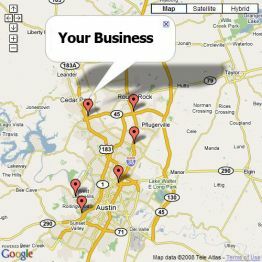 One way to get immediate customers is to get on Google Search and Google Maps for local search terms. It’s a free service specifically designed to help local businesses be found in the search engines when users perform a local search. Now here are some tips that can help you optimize your Google listings. First, fill out every single detail you can. This will help you show up more often on the search engines and get more clicks. Simply put – Google favors local listings with MORE content. If this means making a simple slide show picture video so you can submit a video on your Google listing, so be it. You want to also upload at least 10 photos – and you want to know those photos appropriately in ways that would get your more traffic – i.e. keyword rich photo titles will increase your chances of getting more traffic in the search engines. Let’s talk about keyword optimization a bit more. You have to optimize your keywords in your Google listing so more people can find you when they do local searches. So how do you know what keywords to go after? Simple. Find your competitors websites. Then right click -> view source once you’re on their website. Next, look at the source code at the very top for something called “meta keywords”. Most sites have their meta keywords set. If you can’t find meta keywords, move on to the next site. If you do, simply write down all the meta keywords your competition is using on that one site, then move on. Do this for all your competitor websites and you’ll have a whole bunch of keywords to use when you create your Google listings. For more information on Google, feel free to contact us!